Perform comprehensive analysis by creating custom management/board quality dashboards and reports easily and quickly. AdvancePro Business Intelligence tool by Radial Viewer will give you the information you need and in the format you prefer. This business reporting tool is extremely powerful and easy to use. It will analyzes data and provide meaningful information for effective decision making. 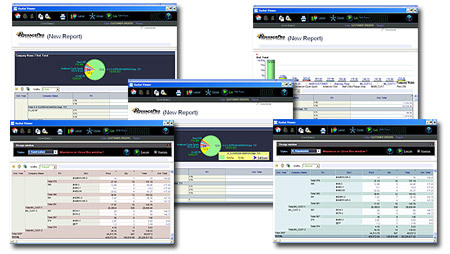 This tool comprises of reporting, query and analysis including search capabilities. You can utilize the various types of charts, graphs, statistical diagrams to have a better insight of your data. You can now understand the past and keep track of the present to make better decisions for the future while using your data as a strategic asset. Use the datasets in the tool along with various types of measures to generate reports of your choice. Export these reports to CSV formats for maximum control. Make sense of your data with this tool and a better understanding of the direction your business is taking.